That sounds like a good spot for the run. Glad to see you do what I do keep them in and warm while the weather is bad. Seems to be what most of us chicken owners do. Ashley Grace is a good chicken owner trying to give then a place to come out but like ours they don’t usually go for it 😉 I’m glad your weather seems to be nicer this week. Hope y’all are well. 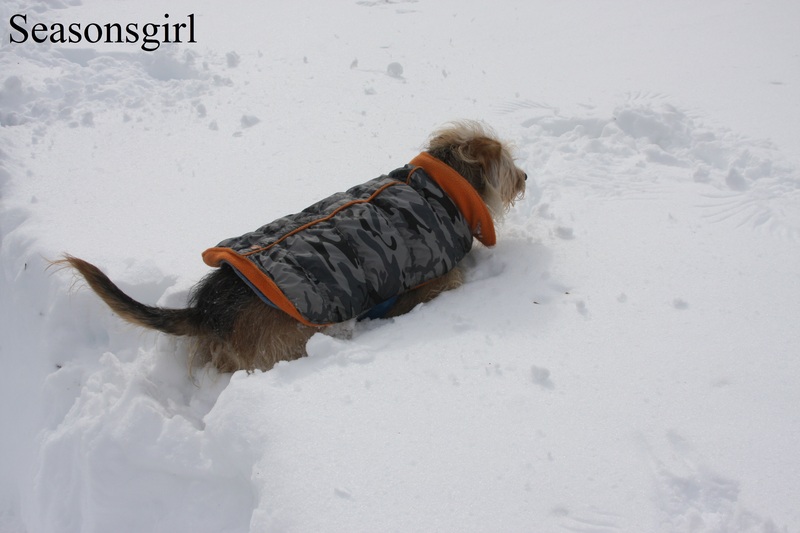 We bought winter-hardy breeds but they do NOT like snow at all and I’ve never seen them wandering in snow this deep. 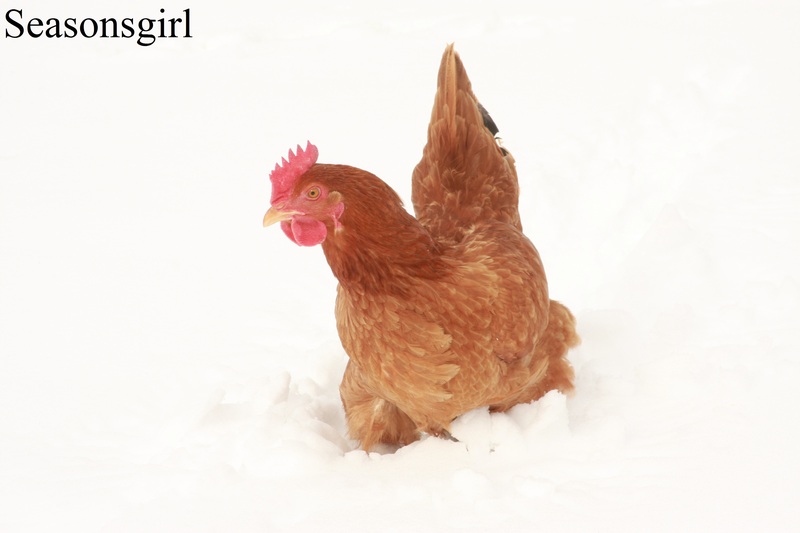 Usually they take a couple steps out and run back into the coop so their toes don’t freeze! But then again, they are all less than a year old yet. 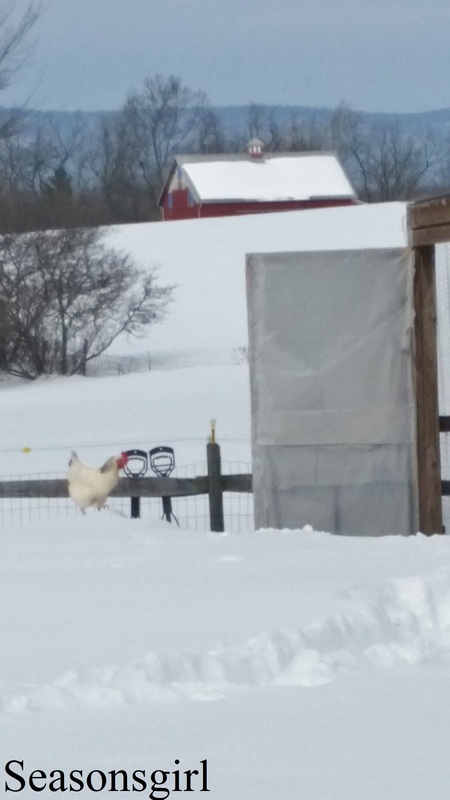 I keep the coop door open for them in the daytime, and on days when it has snowed, I spring straw outside on the snow so they can come out and walk for short periods. This encourages them. 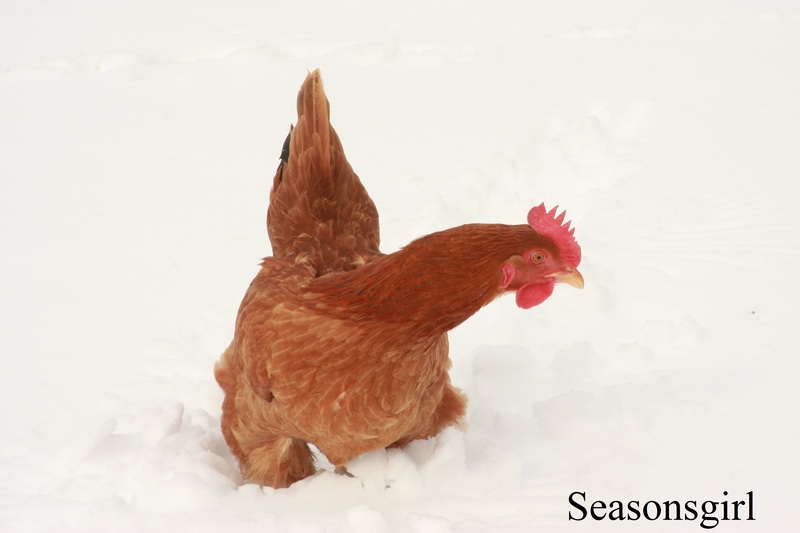 This past weekend, when the low was -11 and windy was biting cold and blowing hard enough to knock me off my feet, I kept them locked inside and did NOT open the coop because of the drafts. 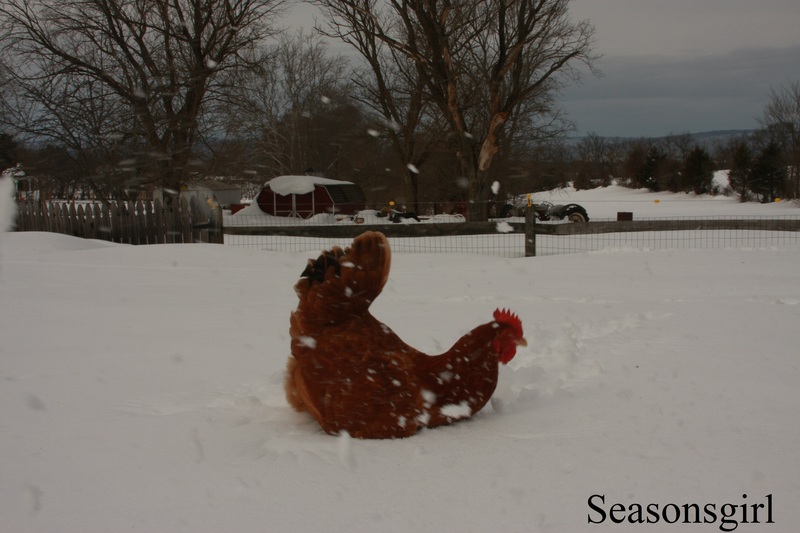 Their coop stayed steady between 10 – 18degrees all weekend, so they did not freeze. Yesterday, we had freezing rain, but the temps were warmer, so I opened the door and let them come and go all day. They mostly stayed in but a few ventured out for fresh air and a cold shower. Around 3:30, I locked them in and turned the heat lamps on to help them fluff dry. Yes, I have heat lamps. My husband installed them because HE believed the chickens would get too cold this winter without extra heat. We argued over it and I let him install them, but told him that I reserved the right to only use them when I deemed necessary. Yesterday was the only time I’ve used them, and they were only on for 2 hours in the early evening, to help warm the air while they dried. I didn’t want anyone to still be damp when night time came and the temps dipped lower. We have some Rhode Islands which are supposed to be one of the hardy breeds. They will come out once the snow starts melting, but surprisingly our New Hampshires are the most curious about the snow. We do what you do as well. We have a coop and run that we keep the door closed to as it does help it to stay warm when it is really cold. Then when its not actually snowing or freezing we open the run door and let them have the option to come out. We have a couple heat lamps we use on a regular basis as it helps keep them dry and we notice it allows them to keep laying regularly as they are not having to spend as much energy keeping warm. I think heat lamps are personal preference, but are wise when it is very cold and wet. Helps the birds as you said dry off and stay warm. Don’t need a sick bird. Ours also get hay in their boxes and the floor of the coop when its bad weather too, as they seem to like to dig a little nest in it and get cozy. We have Rhode Island Reds, too. Also, golden sexlinks. None of them like the snow in their toes. I’m hoping it’s because they are still young. See? I love our golden sexlinks! They are gentle and sweet natured. Our Reds? We have a couple who respond well to affection… we have one who bites of I get close… Several who roar like dragons at everything when they are laying eggs… And one who is standoffish and doesn’t like anyone. We got them because RiR is my husband’s favorite breed. He raised them as a kid. I was new to all of this last spring!! !